Our winner in the healthcare & medical category combines textiles and chemistry innovation in a project that could transform transfusion services and help save lives. Now known as Universal Plasma and spearheaded by NHS Blood and Transplant (NHSBT), the project began life as Sanguis, a collaboration led by Nonwovens Innovation & Research Institute (NIRI), a Leeds-based company that develops innovative textiles products and prototypes for a variety of sectors. Working in partnership with biomed company Macopharma and NHSBT, NIRI developed a new type of filter that removes ABO antibodies from donated human plasma, creating universal plasma (UP) that can be used to treat anyone. NHSBT is now leading the next phase of the project, testing to ensure the filter meets the clinical requirements and patent safety, while Macopharma and NIRI are exploring how the technology can be scaled for commercialisation. Ordinarily, a patient’s blood group must match that of the donor in order for blood and plasma transfusions to be carried out safely. If the wrong type of plasma is given to a patient, the conflicting antibodies can cause haemolysis (rupture of red blood cells) which can result in death. Group AB plasma can be given to anyone, but just four per cent of the UK population has this blood type, meaning its supply is constantly under pressure. As the only currently available universal plasma, AB is in high demand in emergency and military scenarios. When seconds can be the difference between life and death, it affords medics the luxury of not grouping the patient’s blood before treatment. However, AB’s relative scarcity has prompted the search for an alternative and Universal Plasma could present an economically viable and scalable source. According to Ross Ward, new business development manager at NIRI, the new fabric-based immunoadsorption filter is at the core of the project’s innovation. The technology that NIRI uses to graft these antigens is a new proprietary process. Though the company is unable to share too many details, it essentially involves covalently binding the artificial antigen to fibre surfaces within the nonwoven using chemical reactions. The resulting high-porosity filter can remove ABO antibodies from donated human plasma, converting 300ml into UP in approximately 10 minutes. The UP can then be used to treat anyone, regardless of blood type, as there are minimal antibodies present to react with those in their own plasma. Though the concept originated with NIRI, the company knew that collaboration would be key to refining the product and testing it in the field. Working with Macopharma, NIRI designed the filter to ensure it was compatible with the biomed company’s process for manufacturing blood packs. NHSBT, which supplies blood across England, also joined the consortium, which was supported by Innovate UK. “We conducted initial feasibility studies to ensure we were able to bind the artificial antigen and prove the concept,” Ward explained. “Through the project, we worked with Macopharma and NHSBT to develop that technology further. Worldwide, more than 7 million units of therapeutic plasma are used each year, with a market value in excess of £350m. The UK represents £20m of that, and the Universal Plasma consortium envisages significant adoption of its filter here, particularly after the clinical and cost benefits become clear. 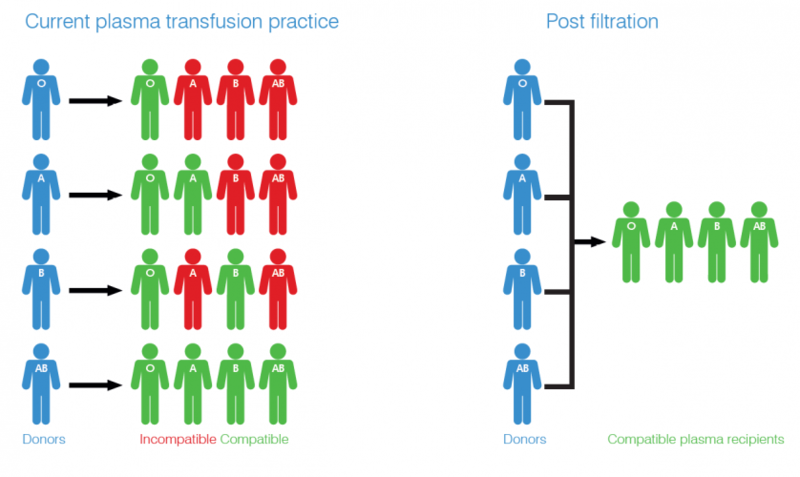 To ensure the product can penetrate the global market, the plan is to offer the technology as an ‘add-on’ rather than integrated directly into blood collection sets. This will allow the filter to be used with any type of blood pack. NIRI is now working with both Macopharma and NHSBT to scale up the process so that it can be deployed en masse. Hadn’t realised the involvement of Leeds Uni in this project: it was my privilege to lecture there some years ago: and one (or more) of my students there and then, stayed on to join NIRI. It was at Leeds that the Prof (Carl Lawrence) described his wish to not only teach students ‘textiles’ but how to think as ‘textile’ folk: as the vehicle for preparing them for their future careers: and I believe that thought and concept has direct transfer into Engineering.